Its name is Pepper, and this little robot certainly made Geneva train station a hot spot on Switzerland’s second national digital day. This version of Pepper, a child-sized model with a rounded body and soulful, ocean-blue eyes, will eventually be destined for hospital departments. 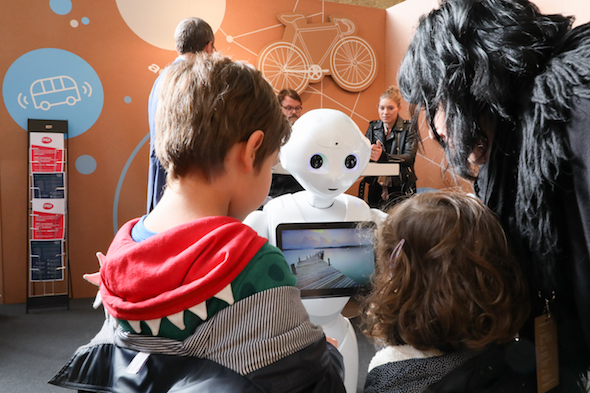 Speaking with a mild, high voice, Pepper is there to explain diseases, direct people and – thanks to an embedded tablet – give children games to play or stories to choose from. Artificial intelligent programming means that Pepper can recognise faces, respond to language and sentiment, and really interact. Other models can be programmed for similar ‘host’ situations in banks or reception spaces, for instance. To the amusements of passersby in Geneva train station on 25th October 2018, Pepper also broke out some dance moves on demand. Pepper’s show was the result of a collaboration between Emakina and GFI, advocates for digital promotion association digitalswitzerland, who want to show the gentle side of innovation in healthcare computing. The second national digital day, organised by digitalswitzerland, took place in 14 districts of the country including the train stations of Geneva, Zurich, Coire and Lugano. How has digital changed our view of the world? This was the question for event partners, who wanted to show and tell the wider public about the possibilities for new technology in our daily lives. 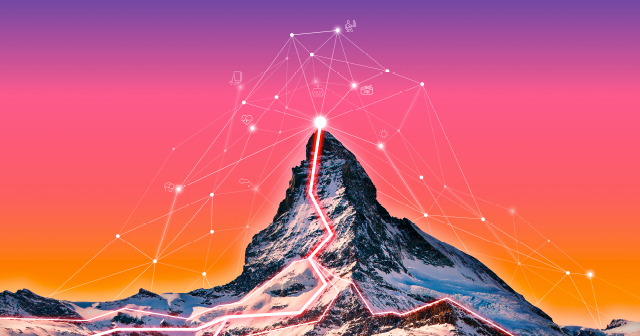 Digitalswitzerland, an association with more than 125 corporate members, also aims to bring together energies and interests, to make Switzerland a world-recognised centre of digital innovation. Emakina was one of the first members to join from French-speaking Switzerland, and supports the association’s six-point action plan and year-long workshops and events to achieve this. “It is all about generating awareness, power and action through a meaningful and diverse cross industry network,” says digitalswitzerland on its website. The annual digital day aims to share the excitement and create a climate of trust for emerging technologies which sometimes inspire apprehension. So Emakina and GFI wanted to present Pepper, the artificially intelligent robot programmed for hospitals to welcome, direct and entertain patients and families in a warm and engaging way. His soft, sympathetic appearance helps people get close to him and children especially make friends with him instantly. On digital day, Pepper was star of the show, inviting children to play with the tablet and even offering to dance or demonstrate some calming tai chi moves. This kind of technology isn’t just for kids, either. The demonstration also aimed to reassure adults who might be suspicious of technology and interaction with a robot. In future, as the population ages, more and more people might depend on a caring device like Pepper to support their needs. 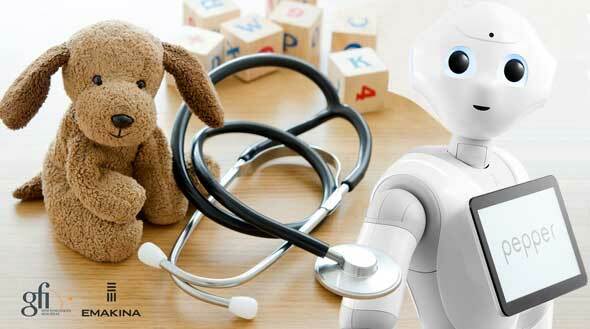 There’s lots to discover in the field of robots – some inventions so fantastic they are difficult to believe. Digital day is a great moment to show off some of these and explain a new world of opportunities to the general public. Welcome to an era where humanoid robots are our new guest relations managers! * You probably wouldn’t buy a Pepper for Christmas. But the care Pepper gives could be priceless! GFI have commercialised the humanoid robot and developed the Pepper program, collaborating with Emakina for events and demonstrations. GFI Switzerland is a digital specialist and part of the GFI Group. A leading European player in essential IT services and software, GFI works both on global and niche projects. It has a huge number of specialists, offering customers the local face of a major brand with industry-grade solutions. Emakina is your friendly guide in the world of building digital business.